CITY OF MIAMI;CROSBY, E. G.
Note: Passenger & freight steamer; 2 stacks; double decked cabin, 100 staterooms. 23, 37 1/2 & 63 x 40"; 2000hp; 105rpm; Craig Shipbuilding Co., 1903. 7' 9" x 10' 8 3/4" watertube boiler. Destroyed with steamer PETOSKY & schooner LUCIA A. SIMPSON. 1903 Ran Chicago - South Haven Line carrying passengers & fruits. 1906, Sep 26 Capt A. Leighton lost overboard between Chicago & South Haven. 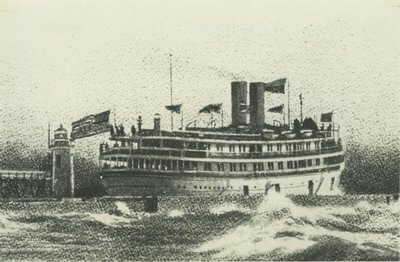 1909, Jun 1 Owned Chicago & South Haven Steamship Co., Manistee. 1915 - 1916 Overhauled at Manistee Iron Works; new boilers (6 - 14 1/2 x 11 1/2' scotch boilers). 1918, May Owned U. S. Government. 1918, Jun 30 Commandeered by Navy, taken to Kraft shipyard, Southern Chicago & rebuilt. 1918, Dec 13 Arrived Boston, never used. 1919, Oct 23 Striken from Navy list. 1919, Dec 30 Owned Fred G. Crosby, Miami, FL. 1920, Jan 15 Rebuilt at Fall River, MA; renamed CITY OF MIAMI. 1920, Feb 6 Owned Havana - American Steamship Co.
1923, May 16 Arrived back at Milwaukee. 1923, May 19 Renamed E. G. CROSBY; ran Milwaukee, Grand Haven & Muskegon Line. 1925, May 11 Owned Detroit Grand Haven & Milwaukee Railway Co.
1925, Dec 19 Tampa, FL; running to Havana. 1926, Aug 19 Back to Milwaukee; laid up at Jones Island. 1930 Towed to Sturgeon Bay, WI.